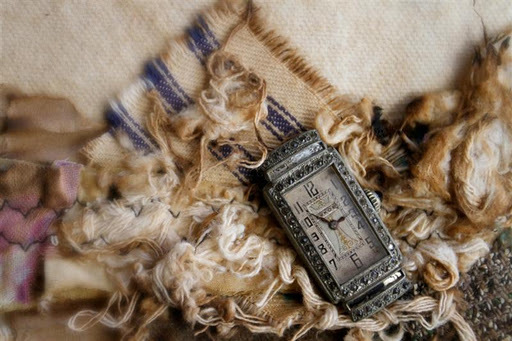 At a small table at Flip’s Trattoria where we met for an afternoon interview, Samantha Lamb reaches into her bag and produces some unexpected items: a polished brass pocketwatch, a mason jar full of fresh honey, and two age-worn cotton handkerchiefs. As she begins discussing her planned work for Momentum Spotlight, she quickly arranges these items into a miniature installation that sets the tone for our discussion. The objects in front of us are often the subjects of her photographs. 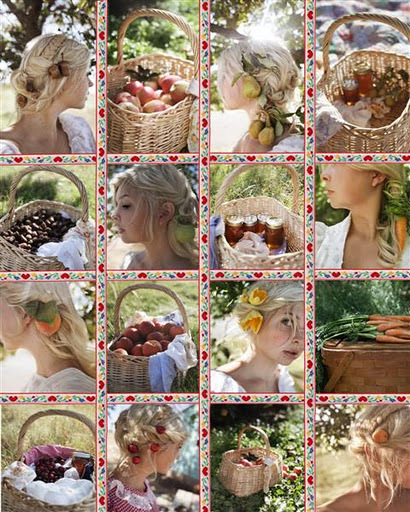 They are also symbols of the farm life that inspires and informs her art. Textures, colors, warmth, and femininity are all explored- and vividly portrayed- in Lamb’s work. It is a reminder that for Lamb, the authenticity of her farm life is crucial. Since arriving in Hobart, she has become a part of the town’s community, from participating in the local farmer’s market to offering kitchen haircuts to a few local men. Fully conscious yet fully joyous, Samantha Lamb’s art shows us a world of rustic beauty, cast in warm light. To take a few steps into this world, don’t miss her installation at MomentumOklahoma City this March 9 and 10. Coker and Hearst just completed their first visits to the Momentum Spotlight artists’ studios. Coker said she has enjoyed the challenge of talking with their artists about their work. She hopes to push them while ensuring the artists retain control of their projects. Next she and Hearst will select the artwork for the general survey exhibition from entries due by January 31. Coker serves as Project Coordinator at City Arts Center in Oklahoma City where she assists with exhibitions, youth and adult studio classes, and more. She received her BFA from the University of Oklahoma. She was a member of the 2010 Leadership ArtsClass of the Oklahoma Arts Council. 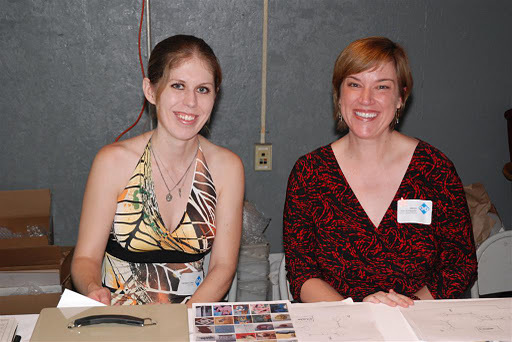 Working with the Oklahoma Visual Arts Coalition before, she interned for the inaugural Oklahoma Art Writing and Curatorial Fellowship and assisted Momentum OKC’s curators in 2010. She continues as an active volunteer for OVAC as well as Individual Artists of Oklahoma and Paseo Artists Association. Also a photographer, Coker has exhibited her work regionally. Submissions for Momentum: Art Doesn’t Stand Stillare due by January 31 at 5 pm. Oklahoma artists aged 30 and younger are eligible. The event opens March 9 and 10. Luckily for us, Alison Hearst will be visiting Oklahoma artists quite a lot this year while serving as Guest Curator for both Momentum OKC and the Residencies for Concept/OK: Art in Oklahoma. Her background should help the community and artists she meets greatly. Now she’s working with the Momentum Spotlight artists on their projects that will debut in March. Her next tasks will be choosing finalists for the Residencies that she will visit in person (entries due January 20) and selecting the juried portion of Momentum OKC (entries due January 31). Hearst is an art historian and writer living in Fort Worth, TX. She completed her MA in Art History from Texas Christian University and Bachelors in Art History from the University of North Texas. She has a long association with the Modern Art Museum of Fort Worth, serving first as an Assistant to the Director and now as an Assistant Curator. Hearst co-founded an experimental art collaborative Subtext Projects. She and her curatorial partner create exhibitions, publications and film series designed to promote discussion about the issues and practices of contemporary art. Also a prolific writer, she has published reviews in Art Critical, Art Lies, Glasstire, and …might be good. She is an editorial advisor and review contributor for a new publication, Pastelegram. 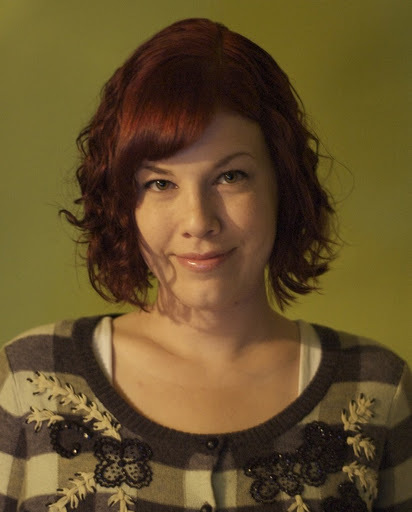 Hearst has interacted with Oklahoma’s art community before as part of the 2010 Oklahoma Art Writing and Curatorial Fellowship and contributing an essay about Liz Rodda for the Art 365 exhibition catalog. Recently, we led two information sessions about the new exhibition, Concept/OK: Art in Oklahoma. At each session, we spent time fielding questions from the artists in attendance. Here are some of the most frequently asked questions. Q: Is there a theme for Concept/OK? A: No. The purpose of the exhibition is to highlight artists in Oklahoma. Both the Residency program and the Survey Exhibition are open to artists working in all media, and open to artwork engaged in any topic. Q: Do I have to teach or do community workshops if I am in the exhibition? A: No. Artists in the Residencies are asked to engage the public, which could include teaching. Artists in the Survey and Focus are not required to participate in public programs or teaching. Survey and Focus artists will be asked to suggest and lead educational programs during the exhibition to add to the outreach and audience, but are not required to do so. Q: If I apply as an individual for either the Survey Exhibition or the Residency, can I also submit an application as part of a collaborative group? A: No. You may apply as either an individual, or as part of a collaborative. Not both. Q: If I don’t get accepted into the Residency program, can I apply for the Survey Exhibition? A: Yes. You may not participate in both, but we encourage those who are not accepted into the Residency to then try for the Survey Exhibition. Residency applicants will be notified in late February 2012. Survey applications are due August 1, 2012 at 5pm. Q: If I am not accepted into the Residency program, can I apply to the Survey Exhibition using the same proposed project? A: Yes. But consider that the project will likely need to be on a smaller scale for the Survey Exhibition. Q: When will the Hardesty Arts Center be completed? Q: Is everyone that enters the Survey Exhibition automatically entered to be considered for the Focus exhibition? Q: Is it really possible that only 25-50 pieces will be chosen for the Survey? A: Yes, we can’t say exactly how many artworks will be in the Survey. The curator will have to look at the type of work submitted before determining what to select. We only offer the 25-50 range as an average of past survey-type exhibitions the Oklahoma Visual Arts Coalition has coordinated. 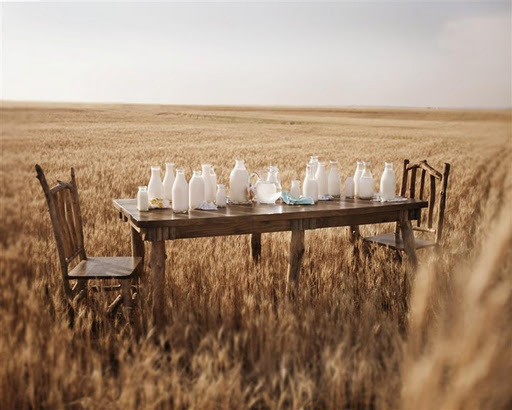 Q: If I am chosen for the Focus Exhibition, how will my work get to Kansas City? A: You will be responsible for getting your own work to Kansas City. Travel Stipends will be available. Q: If I am accepted into the Residency program, when will I receive the money? A: We will issue at least 2/3rds of the honorarium within a few weeks of the notification. The remaining funds will be issued once the show opens. ﻿Q: What facilities will be available to me in the studio while in residence? Are there any restrictions to the use of the space? A: The community studios are made to be durable, with concrete floors and movable walls, to accommodate any type of project you may think of. You should specify what space you would need as you could request a small area up to more than 1,000 square feet. The exterior walls are glass and open to the street. Your project could connect to exterior spaces there. The studio space is not set up as a proper living space, but if your project called for it, you could spend all day and night there, put yourself on display for the public, etc. Most of the Hardesty Arts Center’s other facilities, including printmaking, dark room, computer and other equipment, prep areas, and classroom space, will be available to you as an artist in residence. If you need firing facilities, neighboring groups in the Brady Arts District may partner with us, such as Mel Cornshucker’s ceramics studio and Tulsa Glassblowing Studio. If you have specific questions, i. e. wall coverings or technical needs, please let us know so we can inquire with the Hardesty’s architects. Right now the only restrictions are that the studios must be returned to the state they were in when the residency starts, i.e. repainted if altered, cleaned up, etc. Q: When would the artist be in residence? A: Part of your proposal will include your timeline for the residency. 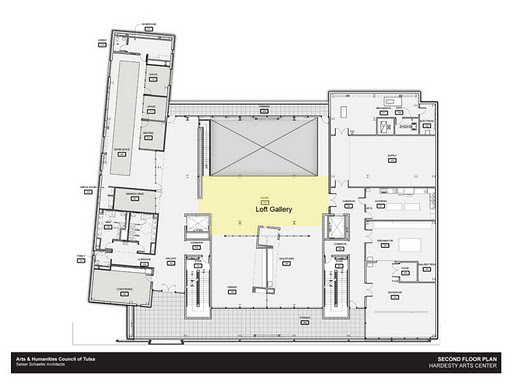 The community studios will be available two weeks in advance of the opening and throughout the run of the exhibition. We would expect the artist to make a commitment to be on site and accessible to the public as possible, but there are no set required hours. Q: What Residency work has to be completed when the show opens? A: You may propose any number of ways of working and showing. Works in progress are welcome. Some completed work and some work still in progress would be fine. The studios allow for exhibiting work, which could be added as completed or start with some work when the exhibition opens. Stillwater artist Liz Roth has two interesting projects that she is pursuing in the coming months. Roth requires a travel easel to help her accomplish her ideas and has received an Oklahoma Visual Arts Coalition Professional Basics Grant in order to help her with her upcoming projects. The first concept is titled Red Dirt Justice, where Roth has been cleared to create oil paintings in Oklahoma prisons. Her aim is to reveal the realities of the war on drugs and the large number of incarcerated women in Oklahoma. The second project Roth is planning is called Overload, for which she will be painting in national parks across the nation. 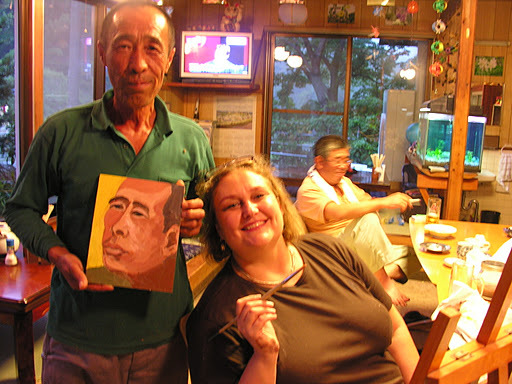 She wants to paint on site, rather than merely snapping a photograph to paint later. 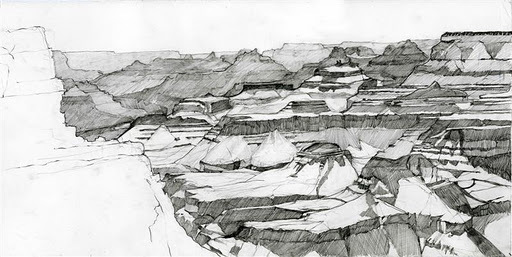 She was the Grand Canyon National Park Artist-in-Residence last summer. The Oklahoma Visual Arts Coalition invests in artists’ project through grants for growing careers, creative projects and exceptional continuing education. The next application deadline is January 15. Find guidelines and application here. 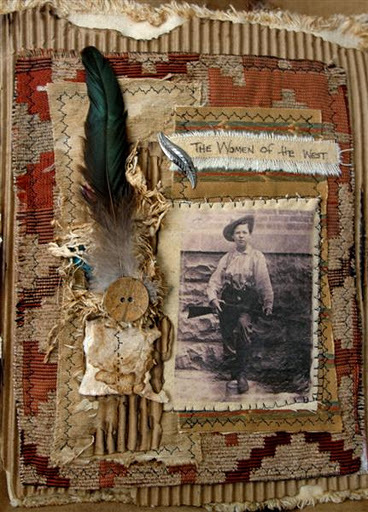 A self-taught artist, Debbie Musick of Yukon has created a style of work that in her words is meant to “explore the layers of everyday life in the American West, past and present, in a tapestry of disparate threads, laughter shared, and stories remembered.” She adds meaningful images, artifacts, and hand rendered text onto textiles to create interesting, textural, mixed media works of art. Musick received an Oklahoma Visual Arts Coalition Education Grant to travel to the North Texas Collage Conference to attend workshops by K. C. Willis, who has been her long-time role model. This workshop will include lectures, hand-on techniques, and business information about fiber arts and collage. Oklahoma Visual Arts Coalition’s new exhibition Concept/OK:Art in Oklahoma offers Oklahoma artists the chance to participate in a residency program. Two artists will be chosen for residencies that come with short term studio space, cash awards of $2,500 each, curatorial guidance and focused attention in the exhibition catalog. Proposals are due by January 20, 2012.
where local residents became subjects and participants in her work. What do we mean by residencies? Artist residencies mean different things in different communities and contexts, from referring to roles as dissimilar as teaching artists working in hosting institutions like schools, to spending time making new artwork in a remote studio. For Concept/OK: Art in Oklahoma, residency artists must connect with the public in new and possibly multiple ways instead of solely making work for the exhibition. Residency artists will be part of the larger exhibition and engage the public beyond the exhibition. Organizers for Concept/OK encourage the chosen artists to interpret “public interaction” as they see fit, allowing for multiple interpretations and dynamic projects. The Oklahoma Visual Arts Coalition and Hardesty Arts Center value new audiences learning about and connecting with living artists. 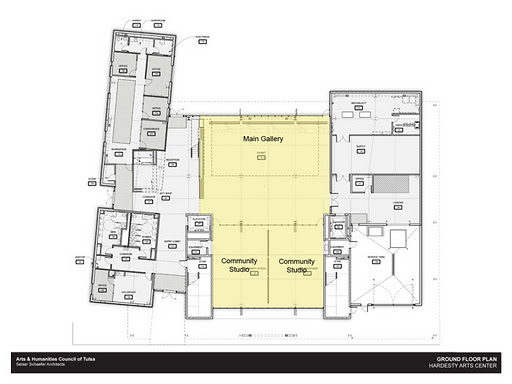 Projects could take place mainly in the community or be anchored in the gallery. For Concept/OK, the residency artists will be expected to create artwork for public viewing in one of the 1,000 square foot community studio spaces. Artwork could be created in advance, allowing for public access or input during the creation process, or in the Hardesty Arts Center before or during the run of the exhibition. Residency proposals could include all kinds of interaction or public programs. Artist will not be expected to be onsite for the entire exhibition, but should propose possible times or duration for working in the studio. In developing their idea, artists should consider who their audience is and what their experience will be. The following are some examples of relevant residency programs. These projects and places are meant as inspiration, not specific models for artists to emulate. residency at the Eiteljorg Museum in Indianapolis. Artists could create a project at the gallery using audience members’ help. Stillwater artist Anita Fields took part in a residency at the Eiteljorg Museum in Indianapolis. 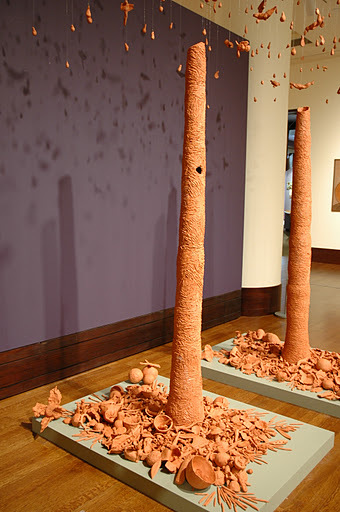 Fields asked visitors to make small ceramic pieces that she incorporated into a larger sculpture. She worked on a daily basis with student groups as well as general visitors, inviting them to participate to create the installation in the gallery. Artists could propose giving insight into their process through educational or other public programs. For instance, Walton Creel created drawings in a residency at the Coleman Center for the Arts in York, Alabama. He generates his drawings by firing bullets through aluminum. During his residency, he visited area residents, offered a demonstration, gave audience members a memento and staged a community paintball event to make collaborative artwork. Proposed projects could take place primarily in the community and have components. For instance, artist Ashley Hunt’s (long) residency at Project Row House in Houston, TX incorporated video, photography, mapping and writing to map the neighborhood around the gallery. He recruited collaborators, staged public conversations, gathered community stories and created a project-specific website to share the project www.communograph.com. Learn more about the background of Concept/OK: Art in Oklahoma, the hosting venue Hardesty Arts Center, the call for artists here. Free info sessions for artists will take place Wednesday, January 4 at 7 pm in Tulsa and Saturday, January 7 at 2 pm in OKC. RSVP to the Oklahoma Visual Arts Coalition if you’d like to attend.